From celebrity artist to highly skilled professionals, we sometimes are able to get a foothold on them and squeeze a nice chat time with them. Don Hickey did with Ron Suchiu at his gallery. Don owns several pieces of Ron's work and he enjoys doing field trips to Suchiu Art Studio. Ronald Suchiu is one of the world′s most unique artists. He masters and blends realistic art with surreal art. He weaves emotions into his paintings with color, reflections and light. He was born to create art. Suchiu is no stranger with the press having done numerous magazine and newspaper articles, along with TV and Radio shows. He is your true artist, a little quirky, at times abstract in his thinking, his wife says he has several personalities, yet he is very confident with the public, and he somehow always makes you feel like an old friend. His artwork is collected in over 26 countries worldwide and housed in such notable collections as The Vatican, H.R.M. Queen Elizabeth II, The White House, The U.S. Embassy, the Prime Ministers of Canada and Malta, and President Nelson Mandela has acquired his work. Such celebrities as Sting, Dan Aykroyd, Eric Burdon, Gordon Lightfoot, Jack Lemmon, Dr. David Suzuki, Dr. Jane Goodall and the Ford Motor Company have all placed their trust in him to deliver world-class paintings. "The Force of Inspiration" George Lucas, creator of Star Wars and Indiana Jones, has given artist Ron Suchiu permission to paint and produce limited edition prints using any of the characters that Lucas has ever created. George has generously agreed to personally sign each limited edition print. Proceeds from them will go to aid the Jane Goodall Institute so that she may carry on with her decades of wonderful humanitarian efforts. 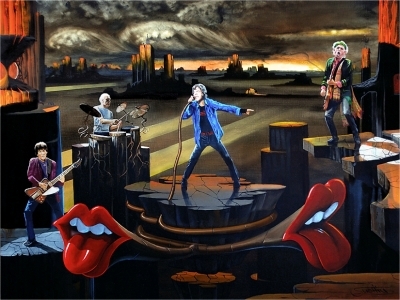 "Paint it Black" featuring the Rolling Stones is the first painting of seven in Suchiu's new mega-collectable series "The Seven Surreal Wonders of Suchiu". This series will spawn a total of only 50 museum quality giclee reproductions of each of the seven exciting surreal artworks by Ronald Suchiu. Suchiu is quickly becoming know as one of the premier surreal artist of our time. A major portion of this first release sold in the first two days of its release at a very private unveiling with Suchiu's personal clients and collectors. This rare collectors series is so uncommonly small in the volume of copies released that it is being used as a marketing case study by an international art marketing and branding academy. Even "pre-release" contracts have been created and approved by the publisher to allow the more serious collectors the ability to book all seven pieces, with the same number, in advance of the paintings actual being created and released. The term "if you snooze you lose" is bang on with the sense of urgency that this series conjures up. 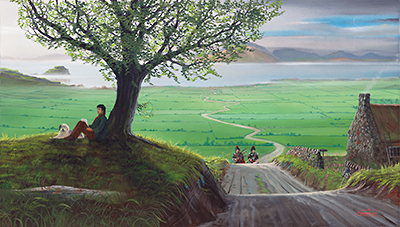 Paul McCartney in "Mull of Kintyre"
This is the second print of Suchiu's "Painted Songs" series. Portraying Paul McCartney under a lazy tree writing the lyrics to one of the world's loveliest songs of the same title. Mull? . . . the tip of a geographic . . . peninsula. In the late 1960′s Paul McCartney discovered a wee piece of heaven at the tip of the Peninsula of Kintyre in southern Scotland. The Mull offered a wonderful secluded place where he and Linda could raise their family and enjoy a life that is very hard to find when you are the most sought after celebrity in the world. The Beatles in "Empty Garden, Hero's Garden"
"Empty Garden, Hero′s Garden" If there is a way to take something that is reasonably easy to understand and make it complex, Suchiu will find it. If he can′t find it he will create it. Why? We will probably never really know, that′s just Suchiu. Make "finding that out " your ultimate challenge if you wish. This painting is definitely going to take some explaining. It is the perfect example of our first statement. Yet in this piece he is taking something that starts off rather complex and turns it into a symphony of sophisticated visual translation. It is proof that he lives his life with an "I′ll see you and raise you one" attitude. Paul and Ringo head back across Abbey Road to visit their old friends... John peers out of the door... "Hey Johnny, won′t you come out and play in the Hero's Garden?" Suchiu feels that paintings should be "imagination seeds" that are planted in the viewer′s mind... he will give you a starting place with a concept and tell you only as much as he feels you need to know. Then you′re on your own to figure the out rest of the story. A story that is meant to grow like an entire tree; first expanding out from roots, developing a trunk, branches and twigs then budding, flowering and bearing fruit and onto shedding its leaves in the fall... etc... etc. His paintings are intended to take on an evolving life... all of their own. The "Empty Garden, Hero′s Garden" got its start from Suchiu′s earliest concept of producing paintings that interpret his favorite songs. The very first song that he committed to his soul to be painted was " by Paul McCartney, which has yet to be produced. The second song he devoted to his production conscience was Elton John′s "Empty Garden". The third being "Candle In The Wind" which has a real neat Suchiu twist and is scheduled for 2006. He says there are so many painted song concepts already inside of his that he feels cursed by them at times. John Lennon in Elton′s song speaks of "Johnny" living in a "brown stone" which is portrayed as the entire left half of the image. If you look closely just to the right of the building... off in the distance you can see a surreal image of an entrance door to the place where John and Yoko actually lived. The Dakota is a gorgeous stone apartment building located directly across the street from Central Park and the spot now designated as Strawberry Fields... In the song Elton sings "So, I keep knocking, but no one answers.I keep knocking, for most of the day. And I keep calling hey hey Johnny, won′t you come out and play" This time we catch Johnny peering out as if to say "don′t worry I am still with you and I always will be"